The illnesses which affect Americans the most are the so called “Diseases of Affluence.” These Include Heart Disease, Cancer, Diabetes 2, Obesity, Alzheimer’s, High Blood Pressure, Stroke, Auto-Immune Diseases and others. Every one of us has either experiences one or more of these personally, or we know someone who has. Many of these diseases can be prevented and even reversed by eating a whole foods plant-based diet. Research shows a high correlation between consuming animal protein and rates of these diseases. But there is good reason for hope, as an increasing body of nutrition science shows that a high percentage of these diseases can be prevented or even reversed by consuming a plant-based diet. In the the third world, people die of malnutrition related disorders. Americans die of over nutrition. We eat too much animal protein, too much fat and too much sugar. Plus, the average American does not get enough fruits, vegetables and whole grains, which are full of protective nutrients that help us fight disease and optimize our health. 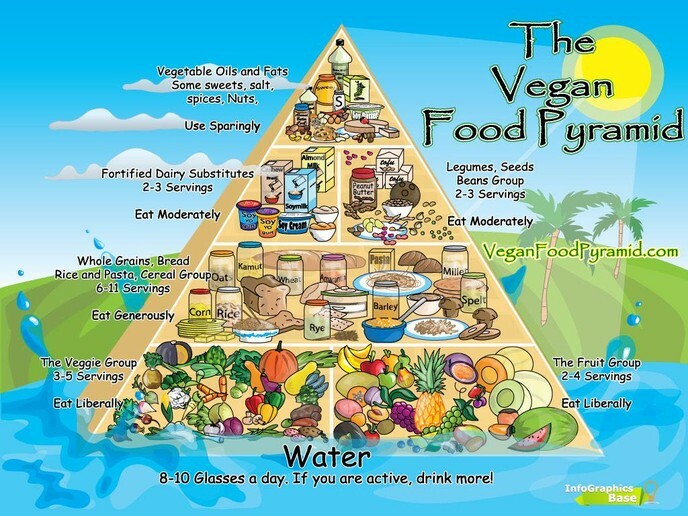 The vegan food pyramid below gives us a general guide for how to eat for optimal health. 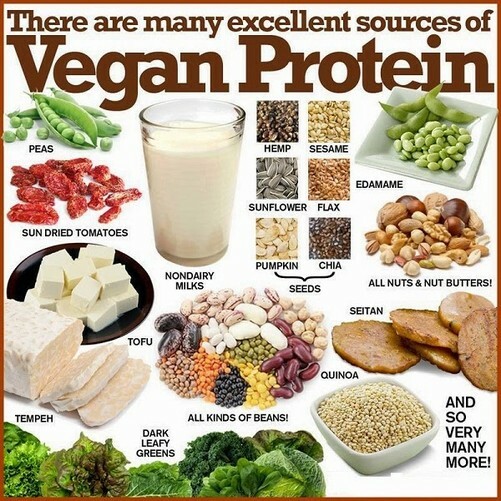 Protein: The first question everyone has about a vegan diet is "Where do you get your protein?" Especially in today's protein obsessed society, many people fear they won't be able to get enough protein on a vegan diet. Fortunately, that fear is entirely unfounded. 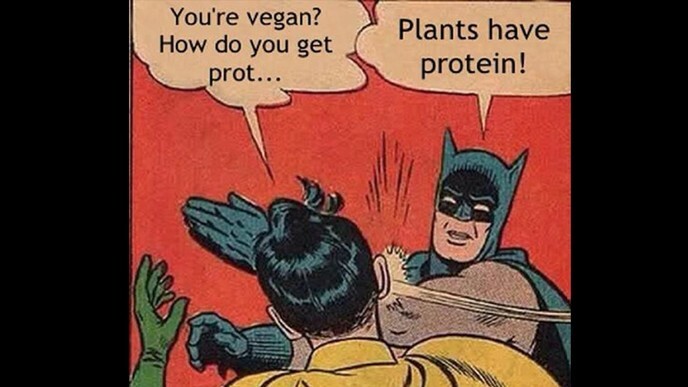 We get our protein the same way gorillas, elephants, and rhinoceroses do, from plants! Plants are an abundant and complete source of protein, even for people with higher than usual protein requirements such as athletes, body-builders, pregnant women and children. The average American consumes 70-100 g of protein a day. In the US, the recommended daily allowance (RDA) is 50-60g, and in many countries the recommendations are much lower. Vegans can get plenty of protein in their diet by consuming a variety of beans, seeds, nuts, whole grains, and vegetables. We can get all the nutrients we need from plants without the toxic byproducts that come from animal products. Fiber and Complex Carbs: Fiber is essential to good health. It binds to toxins in the body and helps eliminate them. It keeps digestion moving. Without it, we are susceptible to the constipation based diseases such as colo-rectal cancer and large bowel cancer. High fiber consumption reduces the risk of these and other cancers, reduces blood cholesterol, and is associated with healthy weight. Dietary fiber is ONLY found in plants, not in animal based foods. Complex carbs, i.e., whole grains, are high in fiber and other nutrients. These are the good carbs. Refined or processed carbs such as white flour, processed breads and sweets are the “empty calories” which lead to weight gain and exacerbate diseases like Type 2 Diabetes. Not all carbs are created equally! Both the Institute of Medicine (the government agency that establishes the RDAs) and the World Health Organization recommend 1,000 mg of calcium per day for adults (or 1200 for those over 50). What really matters is how much calcium we absorb, though, not how much you eat. People generally absorb about 25 to 30 percent of the calcium in their diets. beans, almond butter, soaked almonds, broccoli, kale, okra, sweet potatoes, figs, navel oranges, corn tortillas, and blackstrap molasses. Getting calcium from fruits and vegetables might have some advantages since diets rich in these foods are linked to improved bone health. This may be because plant sources of calcium are often high in potassium, vitamin C, and vitamin K, all of which may be important for keeping bones strong. Getting plenty of iron on a vegan diet is easy. Vegans are no more likely to be iron-deficient than meat eaters. In fact, plant-based foods are some of the best sources of iron available. For example, ½ cup of cooked lentils has nearly twice the iron as four ounces of beef—a food generally thought of as an iron superstar. Adding vitamin C-rich foods to a meals increases absorption of iron. So adding some leafy greens or a 1/2 glass of orange to your meal can help with absorption. There are a few supplements all vegans should be taking. Vitamin B-12 is probably the most important because there are no natural sources of B-12 in the vegan diet. B-12 is a microorganism found in the soil and in some sea plants. If we didn't wash our vegetables so well, or if we ate animals who grazed, we could obtain plenty B-12. However, it's not just vegans who are at risk of B-12 deficiency. -Megaloblastic anemia, in which red blood cells become abnormally large because they can’t divide. -Nerve damage, which can result in a host of problems—everything from depression and mental confusion to tingling and numbness in extremities to a loss of balance and even paralysis. Vitamin D is known as the sunshine vitamin because our bodies make Vitamin D out of sunlight. In theory, if we spend enough time outdoors with our arms and legs exposed (about 30 minutes a day), we can make plenty of our own sunshine vitamin. However, most of us don’t get enough sunshine. Vitamin D deficiency is the most common vitamin deficiency in the world today with an estimated 40% to 60% of the world’s adult population being deficient. It’s hard to get Vitamin D from food sources, (vegan or not), unless they're fortified, like many orange juices and plant-based milks are. A recent study published in the Journal of Neurology showed a 53% greater risk of dementia and a 70% higher risk of Alzheimer’s disease among subjects who had a moderate vitamin D deficiency. Because Vitamin D is so important, if you're not spending enough time in the sun (which is almost impossible anywhere in North America during the winter months), supplementing may be a good idea. D3 seems more readily absorbed than D2, and there are now several good vegan D3 supplements on the market. Omega 3s are important for lowering our risk of heart disease, improving cognitive functioning, and reducing inflammation. Maintaining a good ration between Omega 3s and the less healthy omega 6s is also important. But it's a bit complicated as there are three Omega 3s (ALA, EPA, DHA) and questions about our bodies' ability to convert one into a another. It’s difficult for vegans to get adequate omega-3 fatty acids from their diets, since the two essential omega-3 fatty acids, EPA (eicosapentaenoic acid) and DHA (docosahexaenoic acid) are most available in fish oil. Vegetarian sources of omega-3s provide only ALA (alpha-linolenic acid), a precursor form that the body cannot convert efficiently to the DHA and EPA it needs. Therefore, in order to ensure adequate amounts of these important nutrients, vegans should probably include a variety of ALA food sources, as well as taking a DHA supplement. In addition to incorporating these foods into our diet, it is recommended to supplement 200-300mg of DHA daily. Eat whole foods. That is, foods that are unprocessed and in the state they grew in. This doesn't mean foods have to be raw. Oftentimes, cooking foods can make them healthier and easier to digest. Whether we eat cooked or raw foods is largely a matter of preference and digestive capacity. Make sure the bulk of what you eat is recognizable and try to avoid buying pacakged foods, especially packaged food containing ingredients you can't pronounce, or that have long lists of ingredients. A good rule of thumb is five ingredients or less. Eat a variety of foods. All foods have a different nutritional profile. The greater the variety of foods we're eating, the greater the variety of nutrients we are consuming. Eat the rainbow everyday. Try to eat foods from all the colors of the rainbow. This ensures a wide variety of anti-oxidants, vitamins and minerals.